As we travel to the mountains every few weeks, my children really enjoy listening to books on cd. It’s a great way to pass the time and enter a new world while we drive through the never-ending hills. 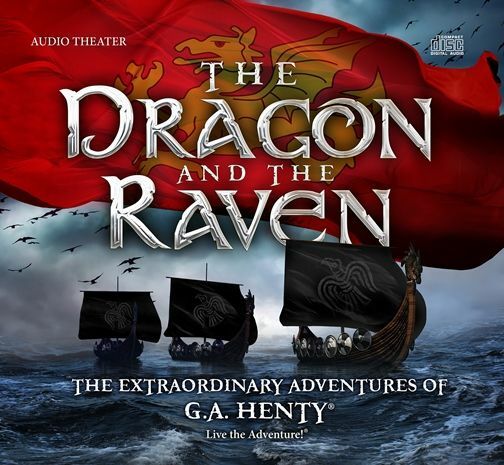 We were asked to check out Heirloom Audio Productions‘ The Dragon and the Raven as part of The Schoolhouse Review Crew and knowing how much my kids like to listen to adventure stories, we gladly agreed. The Dragon and the Raven is a Christian audio drama featuring the extraordinary adventures of G.A. Henty. The recording is two and a half hours log and is geared toward children ages six and up. It comes on a two disc set so you could listen to half one day and half the next or however you want to work it. Through The Dragon and the Raven, we hear about the young King Afred and how he is able to stand against the invaders in England. All 4 of my “bigger” kids were interested in listening to The Dragon and the Raven, but my son especially loved hearing more about the adventures every day. He has listed to the complete story many times and is asking for us to invest in the other CDs offered by Heirloom Audio Productions. We were also given the MP3 download so I can add it right to our children’s iPod for them to listen to during afternoon quiet time. When you purchase the premium buying option of the adventures, you’ll get awesome bonus features such as the study guide, the MP3 set, e-book, soundtrack, and more. The e-book comes as a PDF so we can add it right to the kindle for the kids to read through on their own. In addition to loving listening to the fun adventures, our kids are avid readers and were very happy to read through the adventures as well. The Dragon and the Raven study guide has been extremely helpful in assisting to facilitate conversations between our family members. It features 30 pages of The Dragon and the Raven discussion points, history guides, and even a Bible study! I really appreciate how it helps my children to apply the lessons that they have learned to their everyday life. In the study guide, it is labeled by the times on the CD so you can easily stop and start as needed. There is a section called “Listening Well” which has questions about the section we just heard. Then there are “Thinking Further”, which are more in depth questions that requires more deep thinking. There are also “Defining Words”. These are words that we don’t use often such as oath, monastery, pillage, and muster, and are worth looking up so the kids know exactly what is happening in the story. I found that the study guide was very useful with my twelve and nine year old children. My six year old was able to follow along with some of it but parts were a bit over her head. I recommend you checking out these audio dramas. Two thumbs up from my crew! For more information, visit Heirloom Audio Productions on Facebook, Twitter, or Google+.